It’s one of Dartmoor’s most celebrated legends, the story of Bowerman the mighty hunter and his fierce pack of hounds, a hero of the Devonshire uplands who was loved by all and who never lost his common touch. Bowerman was remarkably strong, with hands the size of peat shovels and shoulders wide as farmers’ yokes; some say he once wrestled a Siberian bear to win a wager with a troop of travelling circus-hands, others tell of him tossing a hogshead full of mead across the swollen wends of the River Bovey with one arm tied behind his back. His legendary brawn was only matched by his kind-heartedness, often slipping his last crown into the collection box for the local orphanage – Bowerman the hunter, ‘man of the people’. This tale is set many blackberry seasons ago, a time when Dartmoor was riddled with strange tidings and mysterious events. The eastern sweeps of the moor – Bowerman’s favourite hunting ground – was notorious for a coven of cantankerous witches. Now let us be clear, not all witches delighted in the terror of local villagers and the wet beds of fearful children, for most of Dartmoor’s wisdom-keepers were white or hedge-witches full of good intention and wortcunning. But not this particular circle who were led by a vindictive, old crone who revelled in making her neighbours’ lives a misery (she may well have had good reason, but that, as they say, is another story). She would summon a plague of scurrying rats to run amok during a church service or leave rotting fish heads and sheep eyeballs under the pillows of farmers’ wives, and that was just for starters, for many of the villagers were experiencing extreme misfortunes, terrible and unexplained bouts of sickness, and disastrous harvests. They all believed it was the hex of the black witch, but none would dare to utter their suspicions out loud, such was her stranglehold. None, that is, apart from Bowerman the hunter, the man who feared nothing, “not even the devil himself” as he would boom out loud in the local taverns, much to the concern of those who believed such unvarnished words were tempting fate. Bowerman could see with his own two eyes the dark spell that had been cast upon the villages and hamlets of eastern Dartmoor and vowed to cast out the withered-fingered hag and the rest of her acolytes who revelled in the misery of honest moorland folk. The witches, too, despised Bowerman because he was the only moorlander not to live in fear of their warped magic and was therefore immune to it despite their most potent concoctions and fervid summoning. One grey evening in mid-Autumn, Bowerman was out with his dogs hunting on the woods and heaths when his hounds caught scent of a hare and began to give chase. The sprung hare twisted and turned, sprinting towards a valley where the shadows loomed large in the fading light. Bowerman and his dogs had unwittingly discovered the witches’ sabbath, the scared place where they conducted their rites and ceremonies, a clandestine gathering which was in full cackle as he and his hounds roared through the vale. He bundled the witches aside, trampling them with his giant boots and sabotaging their ritual, laughing as he did so and leaving them muddied, bruised and squalling with rage. No sooner had Bowerman vanished into the distance, the furious witches were huddled and planning their revenge and a dastardly plot began to thicken. One of the witches, whose name was Levera, had the ability to shapeshift into the form of a hare. With this in mind, the black witch hushed her clawing minions and hatched a scheme to finally outwit Bowerman, their tormentor, and avenge their humiliation. Several moons later, as the icy fingertips of old man winter began creeping across the moors, Bowerman set out with his hounds for his final hunt of the season. As he pressed onwards with his dogs, round the withering slopes, a hare darted from a thicket and blurred across his path. Immediately Bowerman let loose his dogs who went wild at the scent of their most favourite game. They charged across the moorland with Bowerman in tow and an almighty chase ensued; the hare always outwitting the flailing pack, who despite being the finest pedigrees in all of old Devonshire, began to wilt with exhaustion. The magical hare was indeed Levera, the shapeshifter, who had run rings around Bowerman; up and down tors and weaving through woods before leading him and his disoriented pack back to the witches’ vale. Bowerman sank to his knees with exhaustion, and when he looked up, to his dismay, he saw he was surrounded by a horde of spitting and snarling witches all chanting the same eldritch incantation, and for the first time in all his years Bowerman cowered in fear. A most powerful spell was cast. Bowerman the hunter and his pack of fierce dogs were turned to stone; a stack of towering granite that still stands today on Hayne Down, a landmark known locally as Bowerman’s Nose. Some say, on a moonless night in the gathering mist you can still hear the sound of Bowerman and his dogs chasing their quarry across the moors. But the story doesn’t end there. When word spread of Bowerman’s fate, the villagers of the parish were so enraged that they marched mob-handed to the witches’ vale armed with pitchforks and flaming torches. Realising that their spell had been broken, the witches up and fled, mounting broomsticks and carried on north-westerly winds to the great mountains of Wales, banished from Devon and never to return. 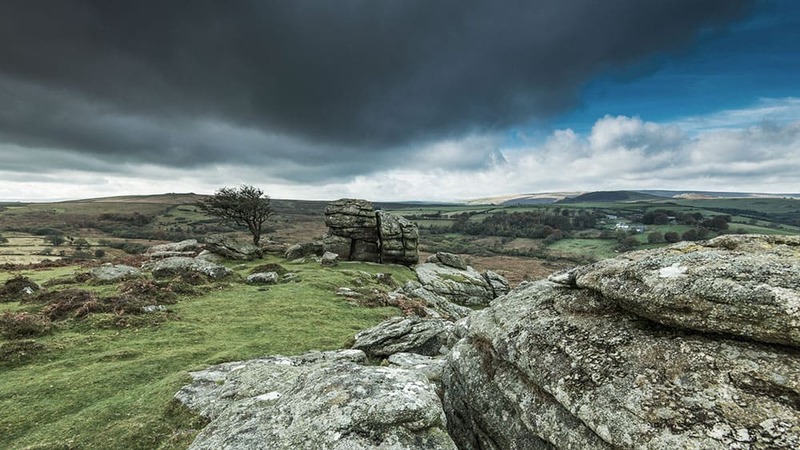 Discover the myths and legends of Dartmoor when you book a stay with Toad Hall Cottages.